An amazing natural rosehip oil that works wonders on dry skin and fine lines. This is not an eczema product, but is suitable for sensitive skin. I consider myself to be more of an eczema blogger than a beauty/ skincare blogger, so I was unaware of the rising number of rosehip oil products there are out there, until I was very kindly send a bottle of Rio Rosa Mosqueta Oil by the lovely people from Rio Health. It is the pure oil of the Rosa Mosqueta wild rose found in the Chilean Andes. A rich source of essential fatty acids, the rosehip oil can be used on scars, stretch marks, fine lines, crow's feet, sun damage and dry skin thanks to its skin regeneration properties. What is the Rio Rosa Mosqueta Oil like? The oil comes in a glass bottle with a pump dispenser. I found this really easy to use and it means that you never dispense more than you need. Believe me this stuff is amazing and you don't want to waste a drop! As my skin is so dry I found I needed two drops/ pumps to fully moisturise my face and jawline. As it's oil it glides on really easily and just smooths in with no rubbing required. There are no added perfumes or chemicals so there is no strong smell at all, just an ever so slightly herbal oily smell, which is quite pleasant. I can safely say that after using the Rio Rosa Mosqueta oil for a week or two that I absolutely love it! It has made the skin on face feel incredibly soft but also firmer and more elastic. I started off wanting to use it all over as it was so amazing but have decided now just to use it on my face as it comes in such a small bottle and it's so precious. I don't really have much of a problem with scars or stretch marks but I do have a bit of a 'V' of fine lines above my cleavage (which I hate!) and it's really helping restore the quality of my skin there. It's also great to apply to your skin before you put your make-up on if you have dry skin. Is it suitable for eczema or sensitive skin? 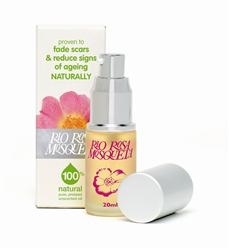 Rio recommend that you do a patch test with the oil first if you have sensitive skin. I didn't experience any problems on my eczema-free skin, but I did find it irritated the skin with eczema patches. However, my skin is quite irritable at the moment, and there are very few products (especially oils) that won't make your eczema feel itchier when it's flaring. Does it make your skin greasy? If you have very dry skin then you'll find that a small amount of oil won't leave your skin greasy. I prefer to apply two drops to my face before bed, and just one drop in the morning before work as when I applied it to the eye area it did highlight the bags under by eyes a little bit, only because of the added shine. However this stuff is so great that even applying once a day I can still feel the difference in my skin 24 hours later. As you can probably tell... I love this stuff! I have never bought into the whole 'anti-age' / 'anti-wrinkle' cream market because a) it's overpriced b) god knows what's in it c) I can't believe that they would really work d) I have moisturised every day of my adult life anyway and d) I can't stand the adverts, especially the ones come complete with a new pseudo-scientific ingredient! But this is a 100% natural product and I can honestly say it works. As I turned 30 last month I think my the timing of my discovery of Rio Rosa Mosqueta oil is perfect! Rio Rosa Mosqueta oil costs £10.49 for 20ml and is available here.